(a) Map propositions as places. (b) The connection THEN between the consequent and antecedent proposition like arcs and transitions for composed disjunctive rules more transitions are required. (c) The antecedent proposition's weight and certainty factor of the rule like the weights of the output and input arc of the consequent transition, respectively. 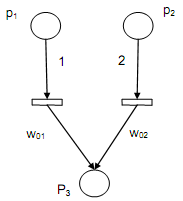 Rule R is shown in terms of Fuzzy Petri Nets as given in following figure. 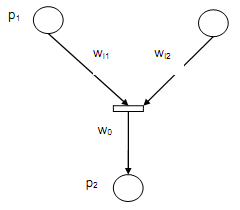 Rule R is presents in terms of Fuzzy Petri Nets by following figure. The rule R is shown in terms of Fuzzy Petri Nets by following figure.